Eros 2019: Annual Release Celebration! for a Celebration of Wine & Love! Escape to Sunstone for the annual release of Eros, our flagship Bordeaux blend! Be the first to taste the 2016 Eros Reserve while enjoying gourmet food, live music, chocolate pairings, and a “kissing booth”. We’ll also have wine club order pickup and an elevated Vertical Tasting Experience available. See all the details below! Open to the Public. No purchase required to attend. Reserve your spot for a special 90-minute journey through Sunstone’s oenological history. This exclusive seated tasting experience features Sunstone Assistant Winemaker Jon Flores guiding you through tasting several rare and coveted vintages of Eros while educating you on the rich history of Eros and Sunstone. 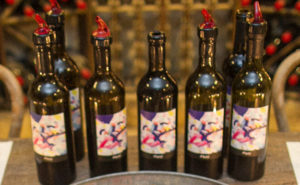 Taste six exclusive wines, including the 2012, 2014, 2015, 2016 and 2016 Reserve vintages of Eros. Enjoy artisan cheeses paired with each Eros vintage. Available Friday at 3pm; and Saturday & Sunday @ 11am, 1pm and 3pm. $75 per person + 18% Gratuity (Member discount does not apply). Each Session Limited to 8 guests; Reservations required. For this weekend only, you’ll have the option of pairing our flight of wines with artisan chocolates from Santa Barbara’s Chocolate Maya! Standard Tasting: $20 (complimentary for members). Add the Artisan Chocolate Pairing for $15. YOU’VE GOT QUESTIONS- WE’VE GOT ANSWERS! Please email taste@sunstonewinery.com or call (805) 688-9463 with any questions!